Happy New Year!! Hello and welcome back! Well Christmas flew by rather quickly didn't it and here we are in 2016, I'm very excited to see what the year holds and looking forward to reading lots of new link ups. Hope everyone had an ace time and here's to a fab 2016! 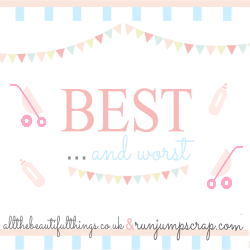 My favourite link up from the last Best and Worst comes from the lovely Janine who blogs over at Unhinged Mummy. This is such a lovely and thoughtful post, it defintley made me feel thankful for things. Go and have a read! Apologies for not being able to feature your logo Janine! Sarah's favourite post was from Thinking Parenting......I absolutely love this post too, myself & my husband have been working really hard on praising good behaviour and being consistent so it's a reassuring post to read.